A month or two ago, my local homebrew club, the Rhode Island Fermentation Technicians (RIFT) decided to undertake a Single Hop Beer Experiment. As described in an earlier post on this blog, this exercise asks each brewer to brew the same American pale ale recipe, but each with a different single hop. Volunteers got to choose which hop variety they wanted to use on a first-come, first-serve basis. Not surprisingly, Centennial, Amarillo, and Cascade were the first hops to be 'signed out'. By having only a single hop in each beer, the resulting brew exhibits the characteristic aroma and flavor of the selected hop variety. It provided an excellent tasting opportunity, as tasting them side-by-side is a great way to judge the similarities and differences of each variety. For the RIFT Single Hop Beer event, seven volunteers brewed beers with seven different hop varieties, with the beers being tasted during the February club meeting. Fellow clubmember Tom H. took notes from the tasting and posted the results on his blog, “And Another Thing…”. Tom H.’s summary notes are reproduced below. US Goldings - "Tea- Like"
Bitterness: Some bitterness, the most so far. Overall: Bordering on IPA, hop forward taste with a big hoppy finish. As Tom H. eludes to in his notes, I was unfortunately not able to attend the tasting, as I was out of town on business. However, I did receive a bottle of each single hop beer and I was able to work through them after the meeting (tough job, eh?). All the beers came out very drinkable, each having its own unique hop character (as indicated above). The beer that stood out the most different was the Summit hopped beer. Summit has this garlic/onion/herbal quality that shines through fairly strong in the beer along with its bitterness (great beer to try cooking with!). This results in a very unique tasting experience that sets the beer apart from all the other more ‘traditional’ hop flavors. Overall, the Single Hop Beer Experiment was a great success amongst the participants (brewers and tasters). 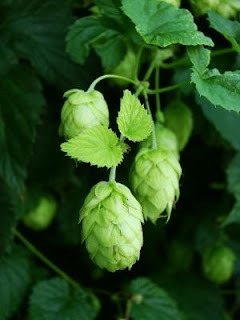 While it is inevitable that there will be flavor contributions from each brewer's personal brewing process and therefore the flavor differences cannot be attributed totally to the hop varieties, it was still very clear the hops made a remarkable difference in each beer. In addition to allowing tasters to target their palates with these hop flavors, it was just plain enjoyable to taste the entire flight – we will definitely return to the concept and do it again in the future. Those are so pretty good taste descriptions. The one that tastes like tea would go well around here.